Not to be outdone in the global race to build artifical islands, The City of Copenhagen has revealed plans to build an island in the shape of a national icon - the bicycle - off the coast of the island of Amager, south of Copenhagen. 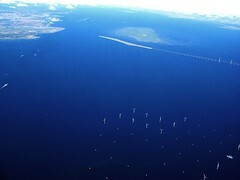 The Bicycle Island - Cykeløen - as seen from space. In an unveiling ceremony at the City Hall yesterday, Copenhagen and a consortium of environmental investors and architects from Denmark and Sweden launched the most comprehensive environmental project in Scandinavian history. 'Cykeløen', or The Bicycle Island, will create much needed real estate for an expanding population in the Danish capital and will become the first Danish landmark to be visible from space. 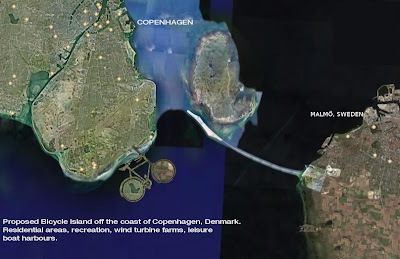 The so-called COMA region, consisting of Copenhagen, Denmark and Malmö, Sweden is experiencing massive growth and The Bicycle Island will act as a symbol for the wealthy region. 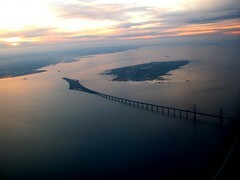 It's proximity to the Öresund Fixed Link bridge and tunnel that connects Copenhagen to Southern Sweden is important for the whole region. While there are plans for both luxury and afforable housing with spectacular sea views for 50,000 citizens, the majority of the island will be earmarked for recreational usage and organic farming, as well as an Environmental Research Institute, which will explore and develop future intiatives. The bicycle has long been a symbol of Danishness and now it is being used as a symbol of the sustainable, environmental goals of the city of Copenhagen, which plans on being the World's Environmental Capital by 2015. Over 36% of the population of Copenhagen ride their bicycles each day on a network of dedicated bicycle lanes and paths. In accordance with the environmental goals set by the city, The Bicycle Island will be fully self-sustainable. All power will be generated by offshore wind turbines and all waste will be recycled. The goal is becoming the world's first carbon-neutral island. With spectacular artificial islands under construction in Dubai in the shape of palm trees and a world map, and with the recent announcement that the Netherlands is planning construction of an artificial island shaped like that nation's symbol, the tulip, Copenhagen decided to push forward the plans. "The choice of a bicycle is obvious for Copenhagen. And the granny bike is a traditional design form in Danish history - it is still the most used kind of bike in the city - and in using this bike design as the shape of the island, we are combining past, present and future in one fell swoop", the press release states. The proposed Dutch tulip island. More detailed plans are expected to be unveiled at the COP15 - Global Climate Conference to be held in Copenhagen next year.